Apple butter is unarguably one of fall’s “hallmark foods.” Is it possible to go the whole season without eating it? Yes. But would it feel right to do so? Absolutely not! I may be a bit biased given that I canned over a hundred homemade jars of it to give out as favors at my wedding last year. In retrospect, that probably wasn’t the best decision I’ve ever made given that learning how to safely can the week before the wedding probably wasn’t a great use of my time, but everyone loved it, so the hours of sweating over pots of boiling water and bubbling apples were worth it. Now, that may sound ominous but making apple butter is actually incredibly simple! Unless you’re trying to make dozens of jars of it for a big event, the canning aspect is superfluous, so for my own personal consumption I usually just store it in the refrigerator. So, what is apple butter? 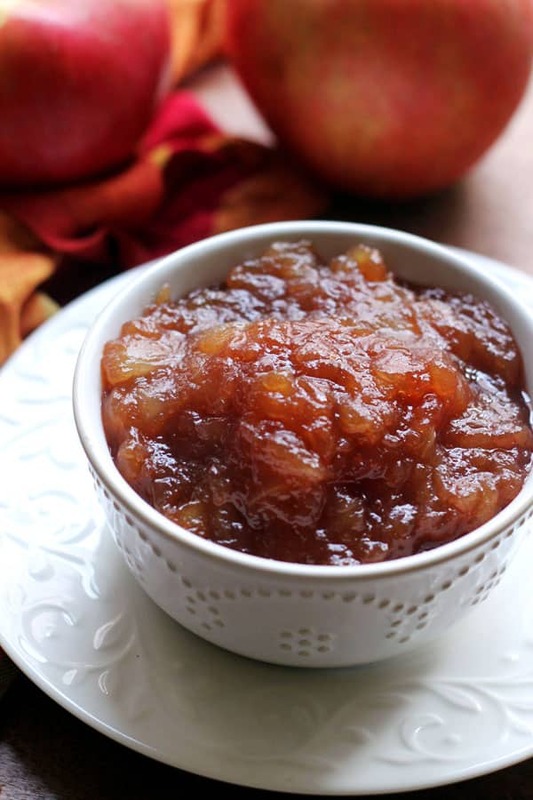 It’s basically a super concentrated form of applesauce that is made by cooking apples in cider or water over low heat for hours until the sugar caramelizes, turning the apple butter a deep brown color and making it really intensely delicious. The higher sugar content also serves as a preservative, allowing the apple butter to be stored for longer in the fridge. To make apple butter, you first need to gather your apples. 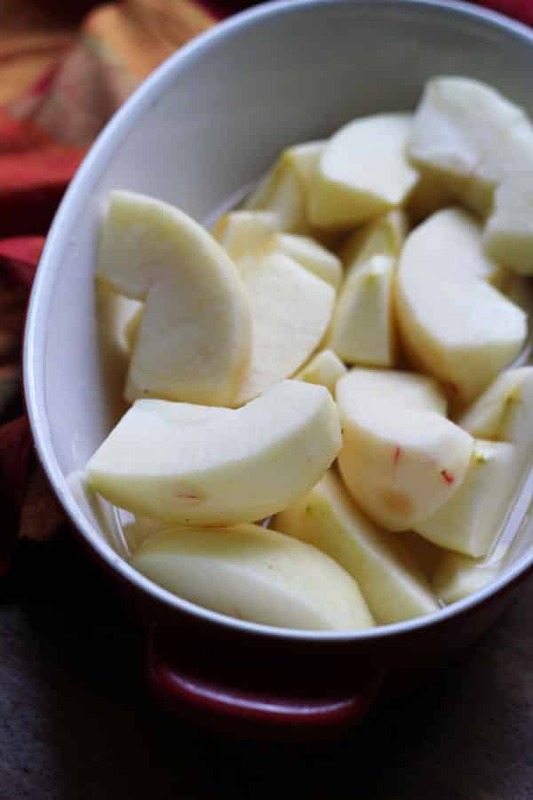 In order to make twelve 4-ounce jars, you need about 4 pounds of apples, though this amount can be halved or quartered according to your family’s apple butter needs. Peel and core the apples, and then cut them into eighths. 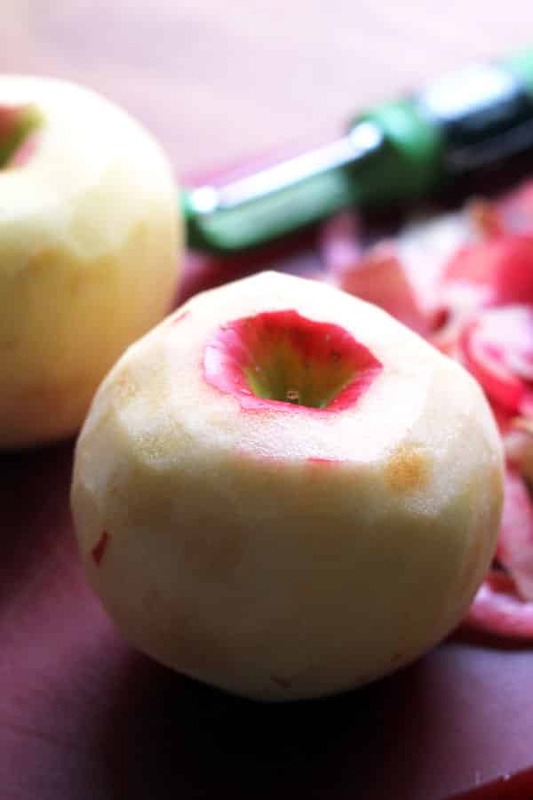 I like to use Honeycrisp apples because they are my favorite flavor-wise, but pretty much any apple will do. 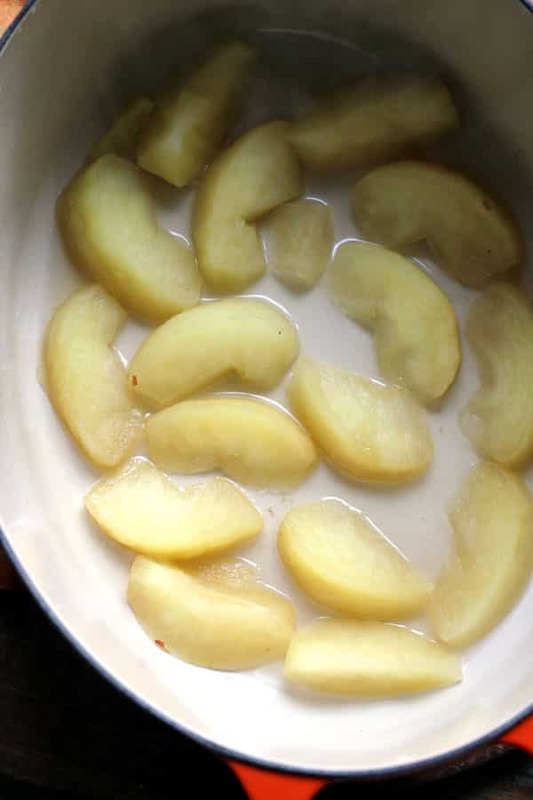 Put the apples in a large Dutch oven, along with 1 1/2 cups of apple cider, 1/2 cup of water, and the juice of one lemon. Bring the mixture to a boil and then lower the heat, allowing it to simmer, covered, for about an hour or until the apples are mushy. If you like a chunky apple butter, you can then mash them with the back of a spoon but if you’d like it to be smoother, then puree it with an immersion blender. Next, stir in 2 cups of sugar and 1 tablespoon of cinnamon. Cook on medium-low heat for one hour, stirring every 10 minutes for the first half hour and then more frequently after that. Over time the apple mixture should become progressively more caramelized, until it is deep amber in color. Allow to cool before slathering over toast or eating straight from the pot! Store the apple butter in a sealed container in the refrigerator after it has cooled. In a large Dutch oven, combine the apples, apple cider, water, and lemon juice. Bring to a boil and then lower to a simmer. Cook, covered, for 30 minutes or until the apples are mushy. Puree with an immersion blender. Stir in the sugar and cinnamon. Cook on medium-low heat, uncovered, for an hour or until thickened, stirring frequently.